OPI's Fall/Winter 2014 Collection is "Inspired by the great northern lights in Finland, deep blue fjords in Norway, and colorful houses in Copenhagen". Yup, you guessed it, OPI is releasing a Nordic Collection! Today I have three polishes from this collection to share with you: Thank Glogg It’s Friday! *, Suzi Has a Swede Tooth*, and My Dogsled is a Hydbrid*. Read on for swatches & reviews on all three! OPI Thank Glogg It’s Friday! "The start of the weekend is nothing to “wine” about!" This is a pretty deep berry/wine colour with a nice blue toned shimmer. Two coats gave me a nice opaque finish, but I did notice that this polish dried to a somewhat dull finish. I definitely recommend using a top coat with this colour! OPI Suzi Has a Swede Tooth "That’s why I always have this strawberry candy pink on hand!" Barbie pinks like this one always attract me! I think that this shade is perfect for Summer, and will look incredible with a tan. This formula was great - perfectly opaque with no streaks in two coats. I wore this polish for 4 days before I got my first chip, which is really good for my nails! OPI My Dogsled is a Hydbrid "Enliven your environment by wearing this creamy sea green." I adore a good mint polish, and this formula is amazing! Two coats left me with a perfectly opaque, creamy finish with zero streaks. Love! I love that OPI has included some bright & fun colours in their Fall/Winter Collection! 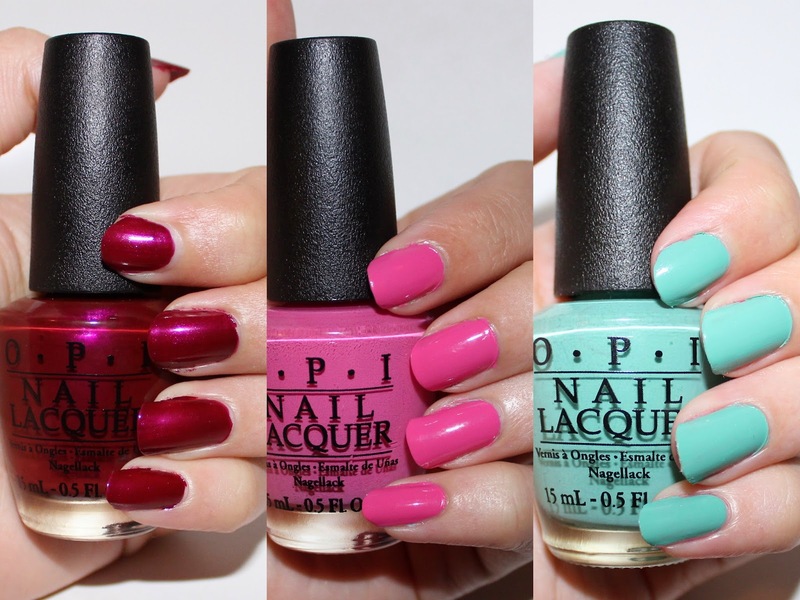 The formulas of all three polishes that I've been able to try out are very good, as I've come to expect from OPI. The new Nordic Collection hits salon shelves August 6th, 2014, at a suggested retail price of $11.50 CAD each. Will you be adding any of these shades to your wishlist? Labels: Creme, Green, Mint, Nail Polish, Nordic Collection, NOTD, OPI, Pink, red, shimmer, Suzi Has a Swede Tooth, Thank Glogg It's Friday! It's soooo pretty & the formula is fab! A mint with a superb formulation? Count me in!! Thank Glogg It's Friday is my favorite out of this collection. Isn't it pretty? :) Definitely the most Fall-appropriate shade out of these 3 polishes! Thank you so much! I'm absolutely loving that colour, I think it'd also make a beautiful pedi shade! I really love the Mint colour! Gorgeous! I love that pink colour! OPI always has the best shades. Thanks Jen! Ooh I'll have to check out that one, I don't think I've ever tried anything from Barry M!